Occassionally you get a review you like and want to share. Today was a long day work. So it was nice to see this review on Goodreads. Thank you so much once again for choosing me as a winner to read your book. My boys loved it. When reading it to them they were on the edge of their seats wanting to know who would win the game. It was nice to have a new book to read them. The pictures were a great addition too. Its one of the best children’s books I now have for my collection. Cannot wait till my youngest grows up so we can share the book with him as well. If you’re a teacher and want to write I hope you do and get to feel this. If you are interested in free short stories, and getting my next book for free before it hits Amazon, and other items I find useful and interesting, please join my Insider’s List. This entry was posted in Announcements, Indie Writing and tagged baseball and aliens, Book Review, Goodreads on November 4, 2014 by mctiller. 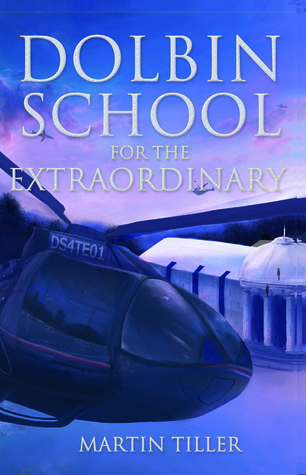 I’m giving away 10 signed copies of Dolbin School for the Extraordinary on Goodreads. Giveaway ends December 01, 2013. And if you wanted to just pay for a signed copy just email me martinctiller@gmail.com and I’ll send one out. I’ve been too lazy to get a link up on the autograph page. Eventually I’ll get one out. For those of you that follow this blog in hopes of learning about indie publishing, I have found Goodreads giveaways a decent way of getting good reviews, meeting new bloggers, and gaining fans. As I wrote before that we need to be dandelions, you just never which thing you do will take root and spread. Try everything and be willing to fail. This is a wonderful review that I got on Kevin and the Three-Headed Alien. I do recommend that when you do a giveaway that you send a personal note, both in an email and in a letter with the book asking for a review. I started doing that with the second Kevin book and got more reviews on Goodreads because of that technique. Kevin and the Three-Headed Alien has more text reviews than Kevin and the Seven Lions does on Goodreads, and I think that is because I started asking for reviews when I did the giveaway. If you have done a giveaway, I would love to hear your experience. Leave a comment sharing your experience. Join my mailing list and get the first notice on new releases. Don’t worry I am too busy to spam. This entry was posted in Choose Yourself, Indie Writing and tagged Dolbin School for the Extraordinary, Goodreads on November 15, 2013 by mctiller. I won this book in a giveaway. I gave it to my 8 year old nephew to read and he loved it. He said he’s already read it three times and asked me if there were going to be more coming soon. My nephew is a very picky reader so the fact that he loved it and has already read it so many times must mean that it is amazing. This is a great example of a dandelion, as Neil Gaiman described it. I gave away several copies last month Kevin and the Three-Headed Alien on Goodreads, and apparently I earned a fan. And apparently I need to get back to writing Kevin books. I write this because I know several readers are working on their own children’s books. This is what could happen when you publish. Trust me. It’s worth it. I have a new book coming soon. Click here to be the first to hear about it with an email. Don’t worry I don’t spam. I am too busy. Kevin and the Three-Headed Alien is 99 cents this week. Check it out. Click here to get Kevin and the Three-Headed Alien. This entry was posted in Choose Yourself, Indie Writing and tagged Goodreads, neil gaiman on September 15, 2013 by mctiller. I have a new giveaway running on Goodreads for Kevin and the Three-Headed Alien. I have five copies to giveaway, and the giveaway is for those in the US, Canada, and the UK. Click here to go to the giveaway. Of course you can just pick-up the paperback on Amazon. It is less than $7. Click on the picture to get the book at Amazon. P.S. I’m working on some new books this summer. Click here to be added to my new release mailing list. You will only receive an email when a new book is ready, and I don’t give or sell your email. This entry was posted in Announcements and tagged Giveaway, Goodreads, Kevin and the Three-Headed Alien on June 17, 2013 by mctiller.